Blue, white and black colors, pomegranates, the moon crown of Isis, veil, solar cross, crescent moon. Black & white lotus, pillars (B stands for Boaz, signifying negation, J stands for Jachin, meaning beginning). Scroll with the word Tora on it (either the Jewish Torah or an anagram of "Tarot," where the final letter is left unseen). 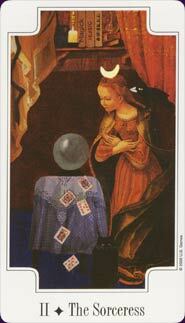 If there is a card that symbolizes the tarot reader it is the High Priestess. A woman (or man!) of psychic powers, intuition and secret knowledge. Where the Magician is about revealing, the High Priestess is about keeping things hidden behind the curtain. Where he urges the querent to verbalize what he's thinking, the High Priestess urges him to silently reflect on his feelings. She is not only the complement to the Magician, however, but to two other majors. 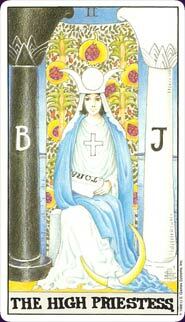 She is the counterpoint to the Hierophant, maintaining secret traditions and rites passed from seer to successor, rather than advocating community traditions. And she is the natural moonlight to the Hermit's manmade lantern, equally solitary and of the night, but acting as restful librarian of information rather than restless seeker of it. 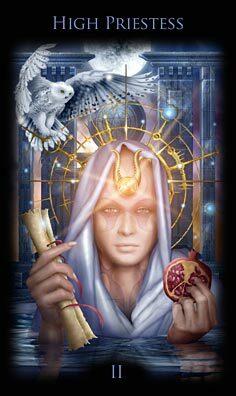 If the reader feels the High Priestess stands for the querent then this is a time of solitary investigation for them or perhaps just a time to trust their instincts. Things kept secret will be revealed, either passed on to them by another or coming to them psychically by way of visions or powerful feelings. Insights may be found in crystal balls, tea leaves, dreams or conversations with spirits. Standing for someone other than the querent, the High Priestess is usually read as a spiritual woman or medium, a teacher of archaic knowledge, librarian or just a reclusive relative who knows many family secrets. She may come across as cold, unpredictable and scary, but her instincts and insights will be uncanny. The High Priestess if often seen as a perpetual maiden, the eternal virgin of an Athena, Diana or Vesta. But some view her as also representing a woman who might be pregnant. In such instances, the High Priestess is NOT viewed as an emblem of fertility, a "mother," but rather as a still, quiet incubator where the "idea" (child) can remain stable and protected. "I've a new idea," says the querent--thanks to the Magician. But now there are decisions to make. What direction should one take this idea? The High Priestess not only offers illumination, revealing secret paths and hidden dangers, but also a still, quiet place between the pillars of dark and light, existence and negation, wax and wane where one can pause, see, feel and reflect on what one really wants to do with this idea. Learn the High Priestess tarot card meaning and the rest of the card meanings, symbols and stories in our eBook.